Item number 1472/6 b from the MOA: University of British Columbia. 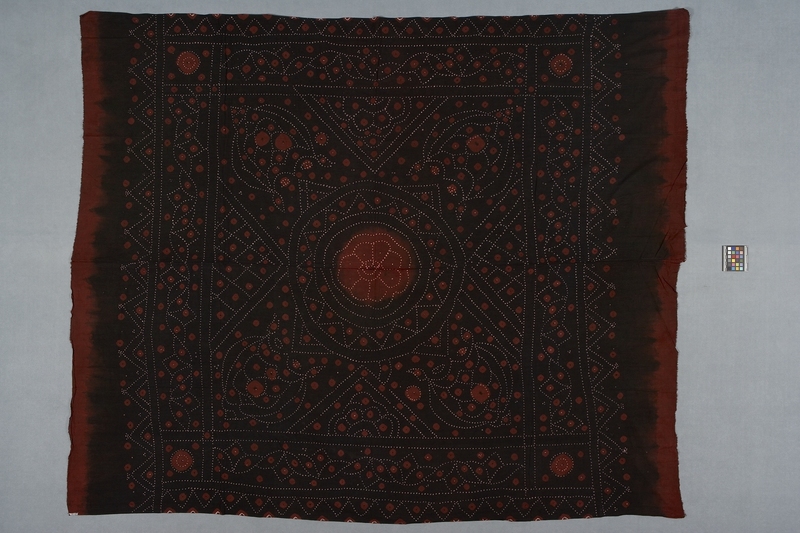 Woman’s dark red and black, tie-dyed, cotton veil; decorated with off-white tie-dyed dots that form geometric, linear and curvilinear patterns. In the center is a round black medallion within a square, dark red panel; there are black borders on all four sides. The veil is constructed from two nearly-identical sections that are seamed together down the center with machine stitching. To be worn with a matching skirt (1472/6 a) and a backless blouse (choli or kancheeri), along with ivory or white plastic bracelets covering the upper and lower arms, as wedding attire by brides who are members of a particular caste. Subtle differences in design, colour and pattern occur among different villages. A women purchases the skirt and veil from a printer for her daughter’s wedding.